The Buenos Aires government would have done the late Owen Lars proud with their newly installed $5 million Intelligent Monitoring Towers. 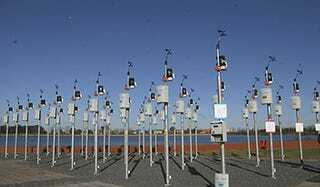 Designed to collect information about the city's air and noise quality, we can easily see these 42 towers being at home collecting moisture on a dusty planet in a certain binary star system far, far away. The towers measure cobalt, ozone, nitrogen dioxide, methane, carbon monoxide, benzene and humidity (just like on Tatooine! ).